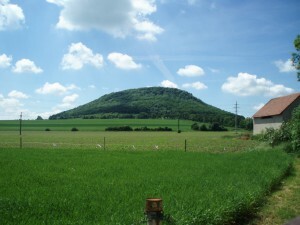 Říp Mountain is one of the most important places and permanent symbols of our national history. A legend about the arrival of our ancestors in the country is related to it, and every orthodox Czech should climb this mountain at least once in a lifetime. Forefather announces to his tribe that he has reached his destination and does not have to plod any longer, and he raises a question about what the name of the new country should be. The people, tired by the long journey, rejoice and exult at the hardship being over and say: ‘After you, it should be named after you.’ And since then, it has been called Čechy (Bohemia). There is a Romanesque rotunda of Saint George on top of the mountain, the first mentions of which date back to 1126. Soběslav I, Duke of Bohemia, won the Battle of Chlumec, near Ústí nad Labem, in the same year, where he defeated Holy Roman Emperor Lothair. To remember it, he had a ruined Říp church restored and a western circular tower built. The rotunda was once used a parish church for the nearby village of Rovná, and even a cemetery was situated around it in the 18th century. You can find the Monument of the Czech State, the statue of St. George with a dragon by B. Seeling of 1870, a sculpture depicting the transformation of the nomadic Slavs into the settled and organized people of agriculture and other historical sights inside.